as you may or may not be aware, i am the proud owner of my very first domain! welcome to http://www.glitteronthedrums.com! now that i’m official and all, be on the lookout for some changes in the next few weeks. spring cleaning hits more than the house! what an amazing week of weather we’ve had in nashville. i think today we actually got over 70. its cloudy, but i can open the windows and let the heater for the house take a much needed break. i’m pretty excited for this weekend – weather wise it’s supposed to be great which means burt and i get to get a lot done around the yard. i think one of the most random things that i walked away from my time as a zookeeper with is my love for pressure washers. that was the first thing to go on my “we need for the new house” list when we bought it last march but sad to say, i still don’t have one. this weekend we’re borrowing the in-laws and i’m tackling a L O N G list of dirty, moldy and paint chipping areas from the front walkway to the siding to the back patio and retaining wall. if i can get all of that done i’d love to plant some flowers in the beds that i tore bushes out of last weekend and finally add some color to look out at. i’m excited, therefore i’m rambling. this is supposed to be a kitty photo friday post, yes? well then on to today’s picture: baby nohea. 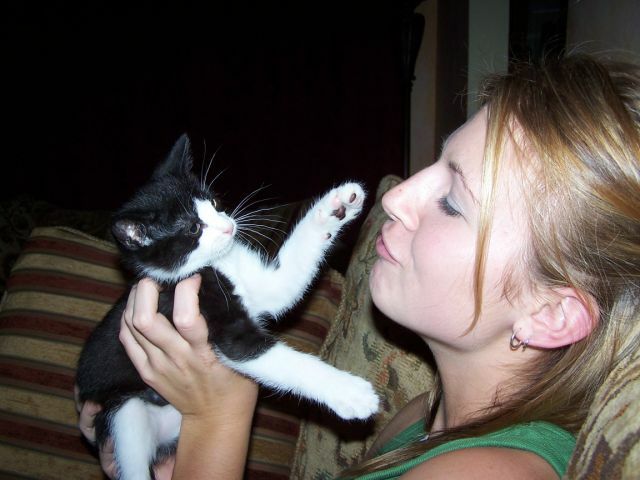 this is the tiny face that i fell in love with in 2004 – this was taken pretty shortly after i brought her home. it’s amazing how little she was! and look at her taking a swipe at me back then. i’m so glad her attitude stuck around. she’s a special girl. with that, i’m off to my weekend – starting with david bazan & jimmy eat world at the cannery ballroom tonight! have a great weekend everyone!